Zestril belongs to the class of drugs known as ACE inhibitors. Zestril and generic lisinopril are used to treat high blood pressure and congestive heart failure. Zestril works by relaxing blood vessels and helping the heart to deliver oxygen to the body more efficiently. Zestril is sometimes given immediately after a heart attack to prevent the risk of secondary heart attack. Some common side effects of Zestril include cough, dizziness, drowsiness, headache, depressed mood, nausea, vomiting, diarrhea, stomach upset, or mild skin rash. Some serious side effects of Zestril include light headedness, fainting, difficulty urinating, flu-like symptoms (fever, chills, body aches), fatigue, muscle weakness, irregular heartbeats, chest pain, swelling, or rapid weight gain. Lisinopril, the generic product is not produced by the same company that makes the brand drug (Zestril). Customers save up to 70% when they buy Zestril online from QualityPrescriptionDrugs.com. Buy discount Zestril or generic lisinopril online and enjoy massive savings! QualityPrescriptionDrugs.com is a trusted online pharmacy that dispenses Zestril, generic lisinopril, and many other cheap drugs at significantly discounted prices. Because the price of Canadian pharmacy meds is regulated by the government, online pharmacies can provide American patients with massive savings. As a Canadian International Pharmacy Association (CIPA) certified online pharmacy, QualityPrescriptionDrugs.com is recognized as a reputable source for genuine Zestril along with a wide selection of other cheap drugs. We only dispense our online pharmacy meds to patients with a valid prescription; moreover, we strongly advise that patients avoid any international online pharmacy that sells Zestril without a prescription as these sites are often fraudulent. 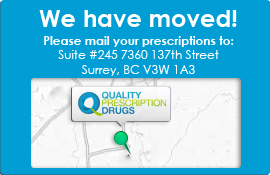 Alternatively, QualityPrescriptionDrugs.com is the best Canadian online pharmacy for safe drugs at affordable prices. If you have more questions about Zestril or any of our products and services, please call us toll free at 1-877-244-0429 Monday to Friday from 6am to 6pm (PST) or Saturday from 7am to 4pm (PST). · Safe, affordable drugs from a trusted source · We guarantee the lowest CIPA pharmacy prices – we’ll even match our competitors · Qualified pharmacists dispense from our large selection of mail order meds · Secure, convenient, and easy shopping in our online store! Zestril 4 out of 5 based on 2 ratings. 2 user reviews. I've been on the 10mg dose for 6 years and my blood pressure has been good. Before Zestril, my blood pressure was over 210/100 and now it averages around 130/90 - a definite improvement. My doctor put me on Zestril after I had a heart attack. I do not like it because the side effects have been a problem.